Sodium is essential in small amounts. Your body needs some sodium to function properly because it helps maintain the right balance of fluids in your body, helps transmit nerve impulses, and influences the contraction and relaxation of muscles. But Americans eat too much salt, and this overindulgence is prompting the Food and Drug Administration to consider limiting the amount of sodium allowed in processed and packaged foods. According to Health.com, the average American consumes nearly 50 percent more sodium than experts recommend, most of it from processed, packaged and restaurant foods. 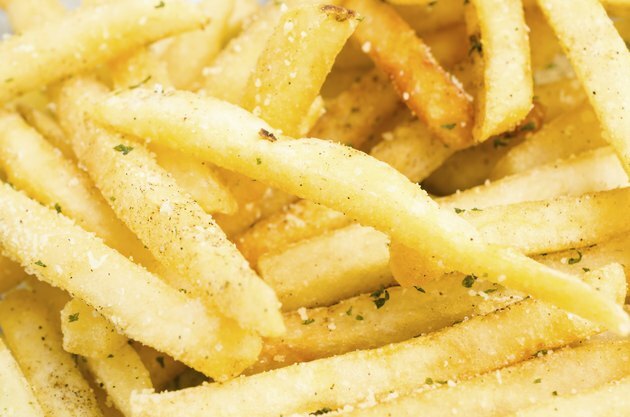 This excess sodium can cause high blood pressure and increase the risk for a heart attack or stroke. On average, Americans consume 3,436 mg sodium daily. According to the American Heart Association, many experts now believe that lowering daily consumption to no more than 1,500 mg of sodium daily would be an effective way to prevent or lower high blood pressure. However, the high amount of salt used in the processed food industry makes it difficult for Americans to achieve this goal. Sodium is often hidden in foods that don't taste salty, such as cheddar cheese and many processed foods. Salt can also be found in many substances that you might not suspect. Sodium can be an ingredient in medicines, especially many nonprescription medications. Examples are members of the non-steroidal anti-inflammatory drug family, or NSAIDs, as well as antacids. Sodium is listed on product ingredient labels, so check your medications. Many canned and other processed foods contain high amounts of sodium, so it is important to read package labels. Processed or refined foods, such as instant soups, packaged mixes and snack items, usually contain high amounts of salt. By eating fewer of these foods and more fresh fruits, vegetables and low-fat dairy foods you can increase your intake of important nutrients such minerals and vitamins while reducing your salt intake. Increasing potassium and magnesium intake by eating more fruits and vegetables can help lower systolic and diastolic blood pressure by two to six points. Foods high in potassium include bananas, dried apricots, cantaloupe, orange juice and potatoes with the skin on. Spinach, broccoli, nuts, seeds and legumes are good sources of magnesium, another healthy mineral. You can limit dietary sodium by restricting the use of ready-mixed sauces, seasoning and salad dressings, frozen dinners, and canned soups, which are usually high in sodium. Choose products labeled "low sodium" that contain less than 140 mg of sodium per serving. Eat lots of fresh or frozen fruits and vegetables; they contain important nutrients and very little sodium. Remove the salt shaker on the table and use salt substitutes, but sparingly. When cooking, use half of the salt called for in recipes.